During a 24 hour period, user activity on Twitter peaks between 12pm-1pm, 5pm-6pm and 8pm-9pm. Sadly, many social media marketers only run their campaigns during the working day; between 9am and 5:30pm. This means that an account effectively goes into radio silence during one of the busiest times on for users. 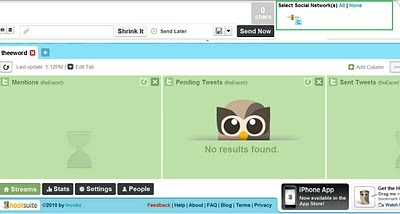 However, using the Hootsuite Twitter service it is possible to maintain a presence during busy periods, even when you're not physically at a computer. The site features a scheduling option, allowing social marketers to broadcast tweets outside of office hours. Here's a step-by-step guide on how to set up a scheduled message. To begin, select which account you want to broadcast the tweet from. Compose your message and press the 'send later' option. It is also possible to include a link, a hashtag or an '@' mention into this message. Select the time you wish to send the update. Press the 'Schedule button'. The tweet should then appear in the 'pending tweets' tab in the column below. This scheduling option allows you to retain a social media presence even when you are not physically able to compose a tweet yourself. Good practice suggests that you reply to all @ mentions as soon as possible.